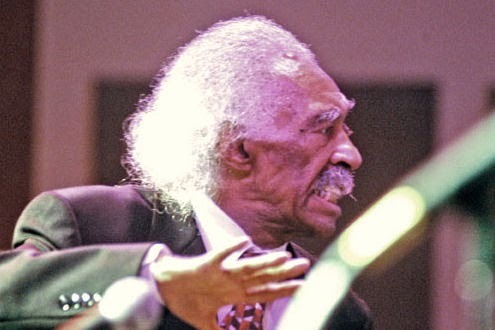 Gerald Wilson, a bandleader, trumpeter, composer, arranger and educator whose multifaceted career reached from the swing era of the 1930s to the diverse jazz sounds of the 21st century, has died. He was 96. Wilson, who had been in declining health, died Monday at his home in Los Angeles, two weeks after contracting pneumonia, said his son, jazz guitarist Anthony Wilson. In a lifetime that spanned a substantial portion of the history of jazz, Wilson's combination of articulate composition skills with a far-reaching creative vision carried him successfully through each of the music's successive new evolutions. 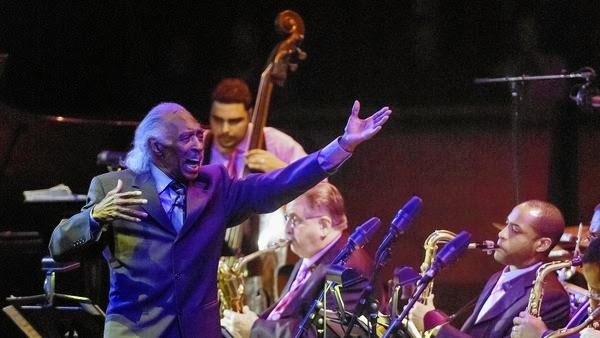 He led his own Gerald Wilson Orchestras — initially for a few years in the mid-1940s, then intermittently in every succeeding decade — recording with stellar assemblages of players, continuing to perform live, well after big jazz bands had been largely eclipsed by small jazz groups and the ascendancy of rock music. Seeing and hearing Wilson lead his ensembles — especially in his later years — was a memorable experience for jazz fans. Garbed in well tailored suits, his long white hair flowing, Wilson shaped the music with dynamic movements and the elegant grace of a modern dancer. Asked about his unique style of conducting by Terry Gross on the NPR show "Fresh Air" in 2006, he replied: It's "different from any style you've ever seen before. I move. I choreograph the music as I conduct. You see, I point it out, everything you're to listen to." That approach to conducting, combined with the dynamic quality of his music, had a significant impact on the players in his ensembles. "There's no way you can sit in Gerald's band and sit on the back of your chair," bandleader/arranger John Clayton told the Detroit Free Press. "He handles the orchestra in a very wise and experienced craftsman sort of way. The combination of the heart and the craft is in perfect balance." Wilson's mastery of the rich potential in big jazz band instrumentation was evident from the beginning. Although he was not pleased with his first arrangement — a version of the standard "Sometimes I'm Happy" written in 1939, when he was playing trumpet in the Jimmie Lunceford band — he was encouraged by Lunceford and his fellow players to write more. "Hi Spook," his first original composition for big band, followed and was quickly added to the Lunceford repertoire. Soon after, Wilson wrote a brightly swinging number titled "Yard Dog Mazurka" — a popular piece that eventually became the inspiration for the Stan Kenton hit "Intermission Riff." It was the beginning of an imaginative flow of music that would continue well into the 21st century. Always an adventurous composer, Wilson's big band music often had a personal touch, aimed at displaying the talents of a specific player, or inspired by many of his family members. After marrying his Mexican American wife, Josefina Villasenor Wilson, he was drawn to music possessing Spanish/Mexican qualities. His "Viva Tirado," dedicated to bullfighter Jose Ramon Tirado, became a hit for the Latin rock group El Chicano and was one of several compositions celebrating the achievements of stars of the bullring. "His pieces are all extended, with long solos and long backgrounds," musician/jazz historian Loren Schoenberg told the New York Times in 1988. "They're almost hypnotic. Most are seven to 10 minutes long. Only a master can keep the interest going that long, and he does." In addition to his compositions, Wilson was an arranger with the ability to craft songs to the styles of individual performers, as well as the musical characteristics of other orchestras. It was a skill that kept him busy during the periods when he was not concentrating on leading his own groups. "I may have done more numbers and orchestrations than any other black jazz artist in the world," he told the Los Angeles Sentinel. "I did 60-something for Ray Charles. I did his first and second country-western album. I wrote a lot of music for Count Basie, eight numbers for his first Carnegie Hall concert," he said. He also provided arrangements and compositions for such major jazz artists as Duke Ellington, Dinah Washington, Billie Holiday, Sarah Vaughan, Dizzy Gillespie, Ella Fitzgerald, Nancy Wilson and others, as well as — from various genres — Bobby Darin, Harry Belafonte, B.B. King and Les McCann. Wilson's longstanding desire to compose for symphony orchestra came to fruition with "Debut: 5/21/72," commissioned for the Los Angeles Philharmonic in 1972 by the Philharmonic's musical director, Zubin Mehta. His "Theme for Monterey," composed as a commission by the Monterey Jazz Festival in 1997, received two Grammy nominations. In 2009, on his 91st birthday, he conducted the premiere of his six-movement work, "Detroit Suite," a tribute to the city in which his music career began, commissioned by the Detroit International Jazz Festival. Gerald Stanley Wilson was born Sept. 4, 1918, in Shelby, Miss. He began to take piano lessons with his mother, a schoolteacher, when he was 6. After purchasing an instrument from the Sears Roebuck catalog for $9.95, he took up the trumpet at age 11. The absence of a high school for African Americans in segregated Shelby made it necessary for him to begin his secondary school studies in Memphis. But a trip with his mother to the Chicago World's Fair in 1933 stimulated a desire to move north, and he was sent to live with friends in Detroit, where he attended and graduated from the highly regarded Cass Technical High School. An adept trumpeter while still in his teens, Wilson played at Detroit's Plantation Club before joining the Chic Carter Band touring band. In 1939 he replaced trumpeter-arranger Sy Oliver in the Jimmy Lunceford Orchestra, then one of the nation's most prominent swing bands. Wilson served in the U.S. Navy at the Great Lakes Naval Training Center during World War II, then moved to Los Angeles, forming his own big band in 1944. Despite the band's almost immediate success, with nearly 50 recorded pieces and a string of national bookings in its first years of existence, Wilson was not satisfied with his own personal level of craftsmanship. He disbanded the ensemble to spend a few years filling in what he believed were gaps in his music education. He also went on the road with the Count Basie Band and Dizzy Gillespie's group. Throughout the 1950s and '60s, Wilson was an established participant in L.A.'s busy music scene, arranging, composing for jazz and pop singers, big bands, films and television, while continuing to be active with his own orchestra. Eager to pass on his knowledge and experience, he taught jazz courses at what is now Cal State Northridge, Cal State L.A. and UCLA, and had a radio program on KBCA-FM (105.1) from 1969 to 1976. As he moved into his 60s, Wilson viewed the commercial activity of his earlier years as the foundation that allowed him to concentrate on his creative efforts. He had worked hard, he told the Boston Globe, so that in his later years he would no longer "have to go hustling any jobs. I have written for the symphony. I have written for the movies, and I have written for television. I arrange anything. I wanted to do all these things. I've done that. Now I'm doing exactly what I want, musically, and I do it when I please. I'm a musician, but first and foremost, a jazz musician." Besides his wife and his son, Wilson is survived by daughters Jeri and Nancy Jo, and four grandchildren. Harvest Moon @ Kitchen 305 w/ DJ Hana, Oct 1st! Al Hicks & Quincy Jones on "Morning Joe"
Rodrigo Lima's "Saga" coming out soon! DVDs & LD of the Day - "Joe Sample"
Bob Barry's exhibition "Performance Portraits"
Fusion CD of the Month - "Moraine: Groundswell"